Shade flees to the folds. Taken as the sun rose over the Plockton Crags on Good Friday morning. Find more dusk and dawn images at WP weekly challenge ‘half light‘. This is also Day 1 of a 7 Day nature photo challenge which Amy nominated me for! Today I’m inviting Sarah to join in. She takes incredibly beautiful and intimate photos of butterflies, birds and flowers. I love her eye for detail. 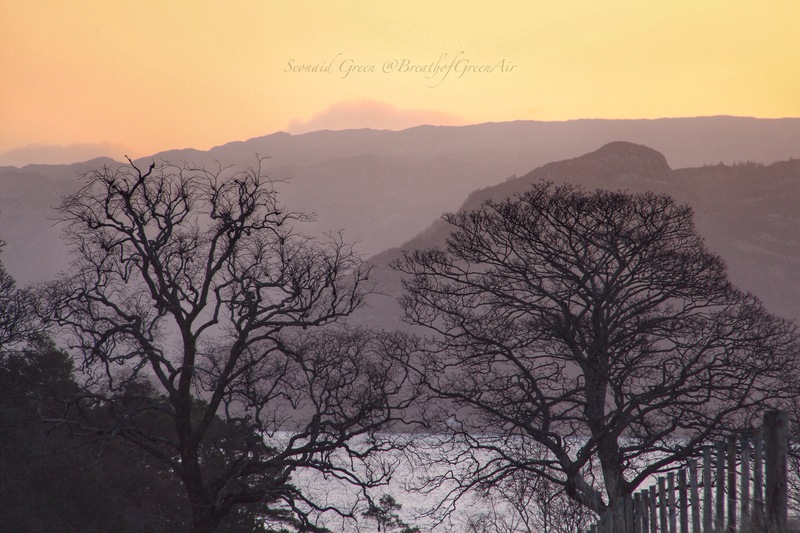 This entry was posted in nature photo, Plockton, poem and tagged Crags, dawn, landscape, mindfulness, nature, photography, Plockton, scotland, sunrise, trees, winter. Bookmark the permalink. those subtle colors really reflect the delicate morning hour. Ohh … the trees look right out of some ancient landscape painting. hahaha I thought of nominating you, but didn’t think you’d want to do it. Glad you have though this is gorgeous and I know I’ll love your whole week! Ahhh, the fresh morning air. The sighs of a new beginning! A timely post as we just agreed to take a small two bedroom apartment. I have a LOT to get rid of… a New Beginning will be good for me… once I get through the old stuff. Need anything for your home??? I have a LOT to get rid of! 😉 As always I love your pictures and descriptive words!! Beautiful! Gwynn, I wish you luck with sorting out what to take with you to your fresh new home, and what to discard or give away. Isn’t it amazing how much stuff gathers around us each year without us really noticing? I just did a big clear out of our food pantry last week😵😳it was a bit scary what I found in there!! I feel a post on this brewing!! Such a very beautiful photograph, Seonid…. What a beautiful, many-layered image, Seonaid! Goodness, so do. I…but something I have seen so very rarely, not living near mountains!